Golfing, mountain bike, hiking, skiing, fishing... Lutsen has it all, and your vacation rental will help you relax between explorations. Spectacular views of Lake Superior too. Enjoy. Asle Ta is a peaceful vacation home in Lutsen. Enjoy the paradise of Lake Superior's incredible shoreline near the Cascade River and Superior Hiking trails. Baileys On The Lake is a beautiful Lutsen vacation rental home with 180 degree views of scenic Lake Superior. Base Camp is a perfect home base for adventures and exploring on Caribou Lake and the North Shore. Black Point is a classic Minnesota vacation log cabin that will transport you back in time to the early days on the North Shore of Lake Superior. Brave Cove is a charming cottage on Lake Superior with great shoreline, hammock and large deck. Caribou Highlands 124B is located in the Birch building of this beautiful resort on Lutsen Mountain near Lake Superior. 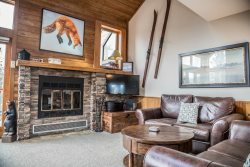 Caribou Highlands 144C is a Cozy Lutsen Vacation Condo Located at Caribou Highlands Lodge Just Steps From Lutsen Mountains. Caribou Highlands 544 is a ski-in/ski-out townhome at Caribou Highlands Resort. Castle Rock is the perfect place for vacation with family and friends near Lutsen Mountain, Superior National Golf Course, Cascade River State Park and more. Cedar Allee offers relaxation both inside and out with amazing Lake Superior views and large deck. Coyote Hill on the Caribou Trail is very private with beautiful views. It's located near hiking trails and many Lutsen activities. Deer Creek will transport you back in time at this one-of-a-kind historic log cabin in Lutsen with pristine shoreline. Fox Cove is an adorable little cabin located on the shores of Lake Superior on Cascade Beach Road in Lutsen. Foxfire is an extraordinary cabin near Lutsen that offers peace and tranquility and beautiful views of Lake Superior.